The narratives of the games differ depending on what title you are playing with Persona 4: Dancing All Night (P4D) having its own story and the other two linking together quite heavily. 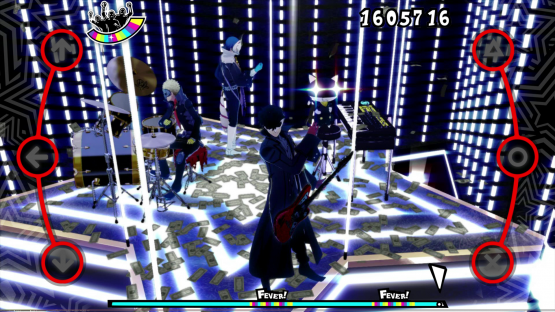 The former is set shortly after the ending of Persona 4 Golden, with a set of particularly strange circumstances leading to the Investigation Team being sucked into the Midnight Stage, to use the power of song and dance to free the Shadows in the world. 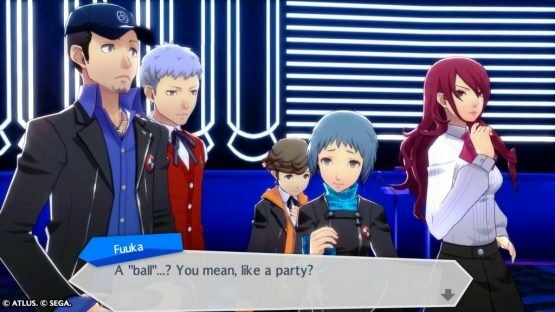 Both of the other games, Persona 3: Dancing in Moonlight (P3D) and Persona 5: Dancing in Starlight (P5D) are heavily implied to be occurring at the same time with both groups (SEES and the Phantom Thieves) being brought to “Club Velvet” while asleep for separate balls by different characters that are all sisters. They’re informed that anything that occurs whilst in this place won’t be remembered when they awaken, so to just dance their troubles away. Yes, this is ridiculous, but it does not matter in the slightest as it doesn’t impact anything from the original titles, operating more as funky side stories. The individual narratives of these two titles unfold through the Social menu in the form of visual novel style interactions between the characters currently in “Club Velvet”. Taking the role of the protagonist, you have dialogue options from time to time, but otherwise the dialogue does play out mostly the same regardless, revealing more of the characters’ personalities and motivations while unlocking in-game goodies. All of this only relates to merely one mode in each game, with the enjoyable Story Mode in P4D and the playful Social Mode feature in both P3D and P5D. Although these are necessary for understanding about why the events of these games are occurring, we all know that the story is somewhat less important than gameplay in these instances. Luckily, they pale in comparison to the gameplay itself and just how enjoyable it is. All three games largely play out in the same way, tasking the player with pressing the correct buttons in time to whatever song you have chosen for your dance. There are four distinct types of notes, comprising of basic, double, hold, and unison notes. Basic notes require the correct tap of the corresponding button, with double needing a double tap instead. Hold notes are pretty self explanatory, requiring the player to hold the button and finally the unison notes, which see two buttons being pressed at once. Successive correct notes will score more points and keep the audience reception high. There are also scratches, which are necessary for those higher point scores needed for the higher ranks to be achieved on songs, that involve a flick of the analog sticks in correct timing, but won’t detriment the overall player score if they’re missed. 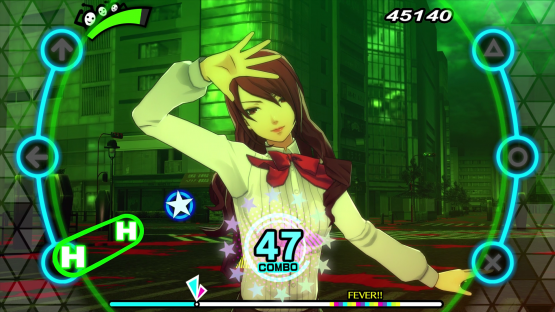 There are, however, “Fever” scratches that can be hit continually to put the player into Fever Mode, which will not only earn a player more points, but also can bring in a second character to dance with the primary dancer in the song. These are incredibly satisfying to hit, but once again won’t detriment a player’s score if missed, so shouldn’t be stressed over too much. If you keep the audience reception high enough by the end of the song, you will pass it and then be able to play the next track. Throw in several difficulty levels and a rather large amount of songs, that are steadily unlocked, and you have a rather large amount of gameplay to be found across the three titles, especially if you are a score chaser like I just happen to be. I’m just not satisfied by a “Stage Clear”, and will keep trying to nail at least a “Perfect”. The content is actually somewhat staggering with a huge amount of accessories and outfits to unlock for your characters. With the P3D and P5D games, these accessories and outfits are unlocked by completing certain prerequisites while playing the game such as clearing songs with a perfect or better and watching Social Mode segments. Whereas P4D adopts the far better system (in my humble opinion) of the player earning in-game currency to spend on all of the beautiful gubbins. Visually, this collection is a treat, with all three games looking astoundingly good, which is especially noticeable with the upscaling to Persona 4: Dancing All Nightfrom the Playstation Vita version. All of the character redesigns, and alternative outfits are awesome to behold; all of the animations are fluid and expressive too, giving each entire package its own distinct feel. This is further fleshed out by each of the three titles having its own distinct visual identity across all menus and UI features too. All of the visuals and dances during the songs are visually arresting whilst not being distracting from what the player should be doing, which is a wonderful feat of balance. 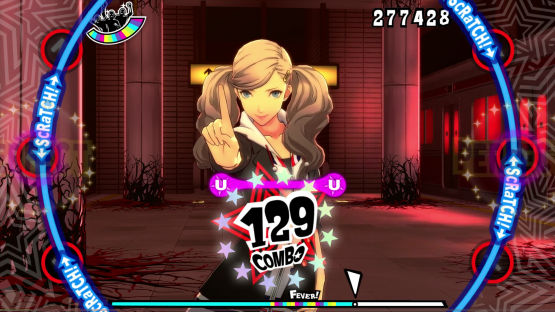 This is seen best in the P3D and P5D games with the music video style, where it is not simply a case of one or two characters but a larger cast with a more stylised and flashy affair. These are some of my personal high points of the games, really showing off the unique visual flair of the individual games. This would all be nothing without an incredible soundtrack and this collection completely knocks this out of the park. These music selections comprise of not only some of the already great music from the three games, but stellar remixes from such artists as; ATOLS, Lotus Juice, and Jazztronik to round out a soundtrack that I have been constantly listening to since starting playing the collection (even now, writing this). Ultimately, whether we can recommend Persona: Endless Night Collection is down to how much you enjoy rhythm action titles. If you enjoy them, this is an incredible collection of great music, stylish visuals, and balanced but challenging gameplay. The story elements are more than a little corny, sure, but the three games have more than enough character and charm to carry them despite this. This being said, owing to a lot of changes between P4D and the other titles such as the removal of Story Mode and the currency system, this isn’t the most consistent package overall. P3D and P5D are not bad titles at all, and are immensely enjoyable in their own right, but P4D just comes across the more cared for and more well-rounded title with the others seeming more hollow by comparison. This minor shortcoming doesn’t detract from how much fun these games are to play, however. I have had a blast in both Club Velvet and the Midnight Stage, and will definitely continue to dive in long after this review period to try to nail some of those harder difficulty songs.